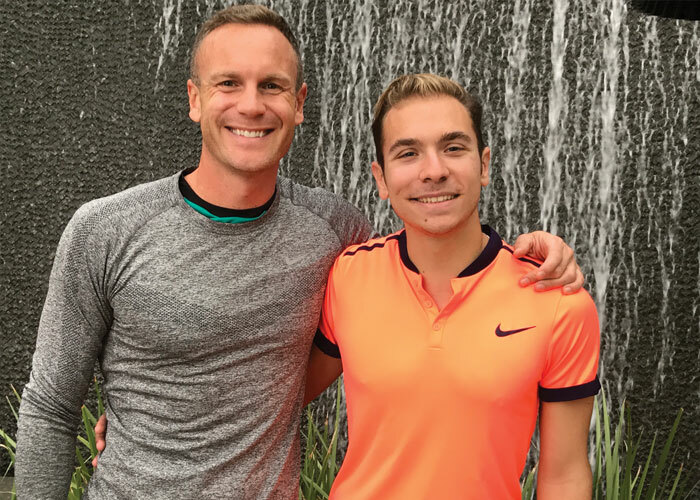 As a single, 44-year old television producer living in Los Angeles, California, Rodney will be playing tennis in Miami with his doubles partner, Eric Mellis. Also involved in biking, running and triathlons, Rodney says that sports offer him the perfect escape from his high stress job. He loves the competition, the drive and dedication it takes to get better as well as the character it gives people. And as a desert lover (“cookies and more cookies”) he loves the added plus that it keeps him in shape. Part 3 of 4. To read the full story check it out in our digital edition. Photo courtesy of Rodney Ferrell. Rodney Ferrell (L) and Eric Mellis (R).